A lot, to be honest. It’s Crypto Week in NYC this week. The last two weeks have been a blur, with so many things happening that I can’t keep up or write about all of them. 1/ The Rockets ended the sweep nonsense talk going on in the bay area with a trompsing of the Ws last night in Houston. Thank God. 2/ The Celtics are showing how great a job Danny Ainge and Brad Stevens are doing running that team. 4/ I will spend the day at William and Nick’s Token Summit and will chat on stage with the CriptoKitties folks at 3pm today. 5/ My friend Steven Johnson, who wrote the seminal mainstream piece on blockchain for the NY Times last year, and I are going to talk crypto tonight at the NY Hall Of Science. Talking with Steven is one of my favorite things to do. 6/ We have completed our Employee Equity Project and are now vetting the data with the USV portfolio companies before publishing it more widely. But I can tell you that the salary multiples that I shared in 2010 in the original Employee Equity – How Much? blog post have risen at least 3x since over the last eight years. I have added a note to that original blog post alerting readers that the multiple table in that post is not accurate anymore. 7/ The Gotham Gal pointed out on her blog yesterday that buying convertible notes in angel rounds delays the start of the clock ticking on the QSBS capital gains exclusion. A great point and one that I have not seen made in the ongoing argument to “convert those notes!”. 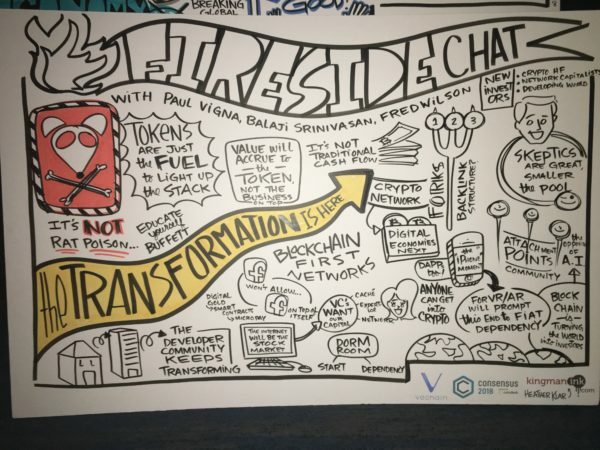 8/ Paul Vigna of the WSJ and co-author of a great book on crypto interviewed me and Balaji Srinivasan, CTO of Coinbase, on stage at Consensus yesterday. It was a fun talk, featuring a high five between us at one point. The video will be online at some point soon and I will blog it. But until then, here’s a fun drawing of the talk.